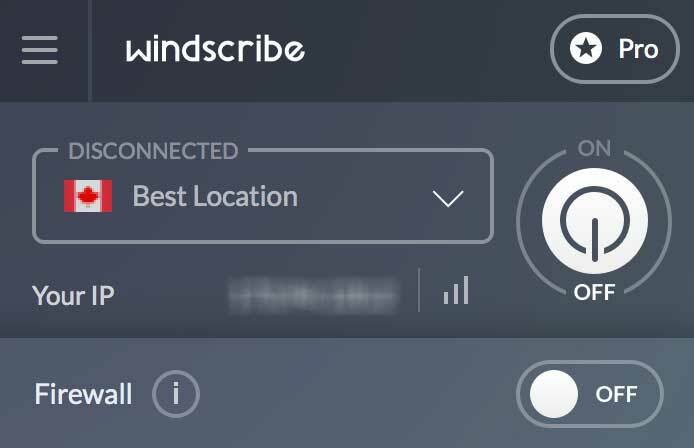 Windscribe is a Canadian VPN provider that’s been on the market for a while. And we don’t know much more about the company itself or the people behind it. They’ve created quite a buzz with their free offer, limited in terms of locations and traffic. 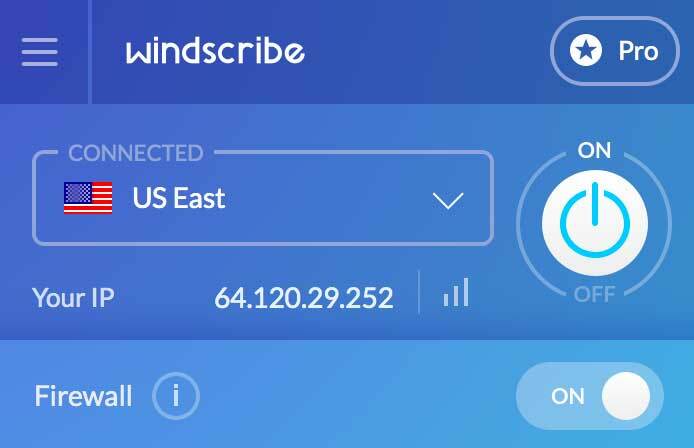 And their other plans have been well received as well, thanks to an aggressive sales strategy and to clever features you’re about to discover in this Windscribe VPN review. Maybe you want to buy VPN to protect your privacy. And this one in particular. 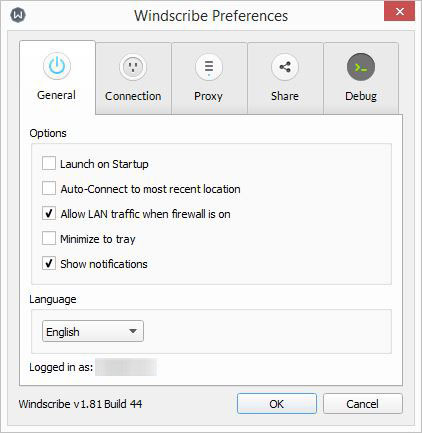 So I’ve prepared this Windscribe VPN review 2019 to help you make up your mind. You’ve probably already seen their ads on social media, promoting an incredible lifetime subscription for a very affordable price. This was a special, limited offer in partnership with a big e-commerce website. And that proves my previous point: This VPN provider is keen on slashing prices and make as much noise as possible! 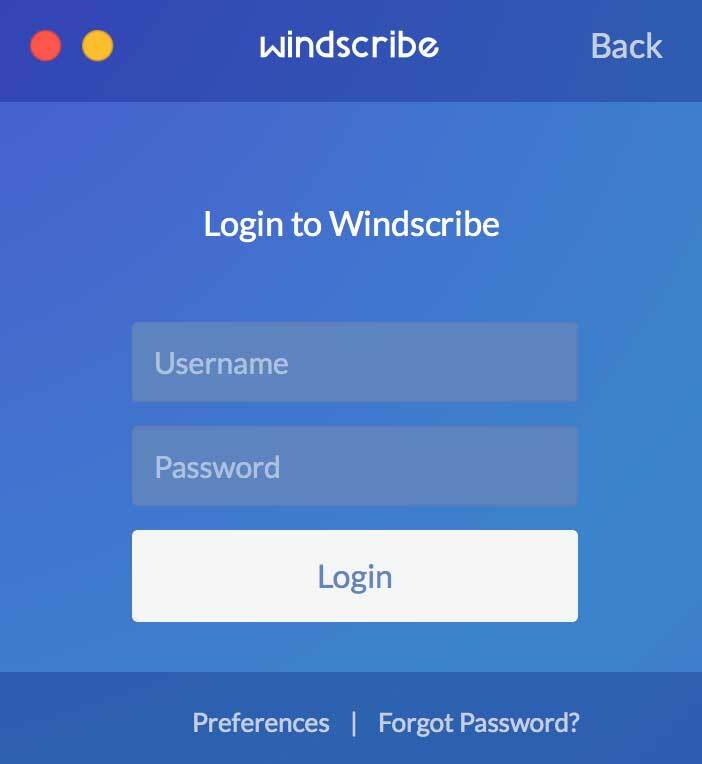 I got in touch with their staff to get a trial version for this Windscribe review. And they kindly granted me a yearly plan. But they want me to be totally honest with you in return: As their business partner, I’m getting paid for this post. However, this doesn’t change anything and I’ll be impartial about the worth of this Virtual Private Network. And it will be part of my top 10 VPN only if it deserves to! This VPN covers all major countries, with dedicated servers for Netflix in the UK and in the US. But I’ll talk about these Windflix servers in details below. And if you want to download torrents safely, it’s possible on selected servers. The company provides a strict no-log policy, collecting only the minimum data..
As explained in my introduction, there are 2 plans: Limited and Pro. The Limited plan is free but limited (it’s in the name duh). And you get only a few server locations, none of them including Windflix servers of course. For the list of servers available in both plans, please visit this page. Also, you get 10 GB of bandwidth usage each month. 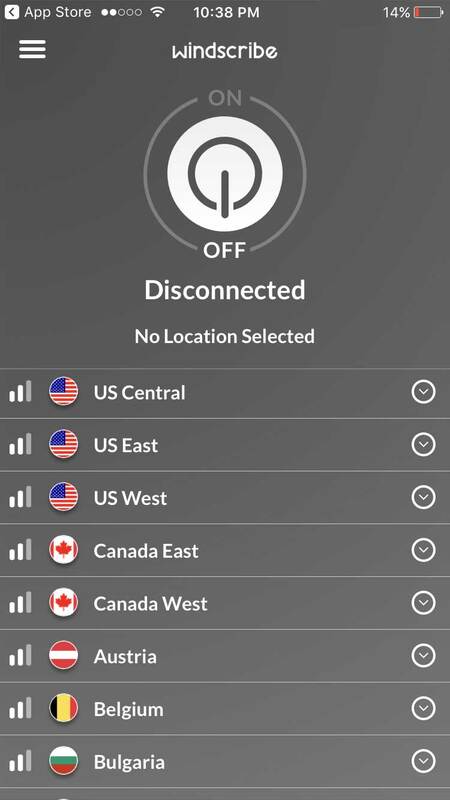 If you upgrade to Pro, you get a fully loaded VPN with all the servers locations and unlimited bandwidth usage. And these days you can select either monthly plan, a yearly plan or a biannual plan. You should use a VPN at all times and on all your devices. So I’d go for the yearly or biannual subscription, to save money. About that, I’m sorry but I don’t have any Windscribe voucher right now… But I’ll update this Windscribe VPN review whenever I fin one! Furthermore, the monthly subscription is really too expensive for what it is. 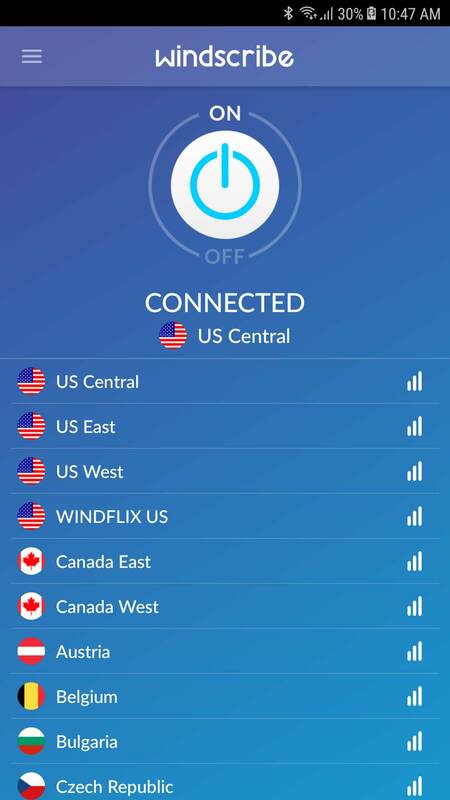 Unfortunately, if you want to try this service by yourself, the Windscribe free VPN may not be enough. Because it lacks the best features, the ones that make it attractive. And the free servers are often loaded with users. So the experience is definitely different from the Pro Plan. And you shouldn’t judge the Pro package with the Limited one. Fortunately, you can try the Pro Plan risk-free with their money-back guarantee. But it’s only for 3 days, which is very short. How to get american Netflix? Easy as pie, just connect to their Windflix US server. How to watch UK Netflix abroad? Same same but different: Connect to their Windflix UK server. And you can see that they’ve got you covered for these two locations: You can watch both US Netflix And UK Netflix. And it’s the most important, right? 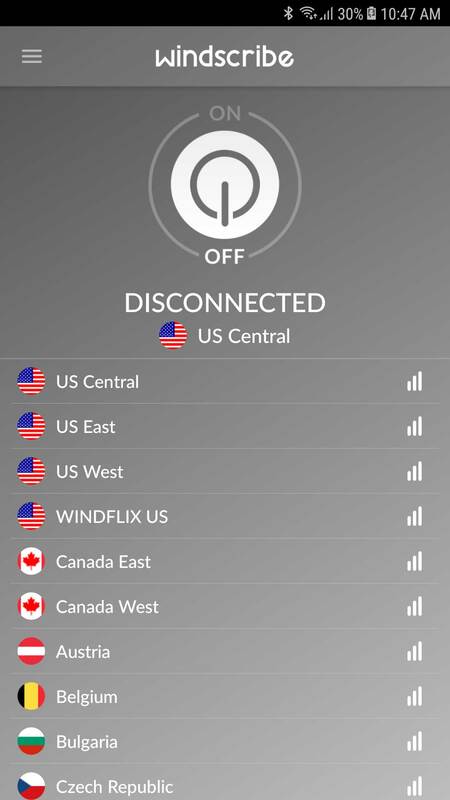 However, these are the only two countries where Windflix servers are available. So don’t expect to be able to connect from other locations to watch their libraries. Because we know how hard Netflix is fighting against VPN proxy… And chances are you can’t unblock other libraries. If you want to bypass torrent block, no problem. They’re torrent-friendly. But only on selected servers. So, if you notice a “P2P” icon, you can’t use this server for torrenting. And you need to choose another one. But most servers accept P2P. Trust me, I had to search for a while before understanding about what icon they were mentioning on their website. See? There are 2 servers where P2P is restricted on this screenshot. Moreover, the company implements a very strict no-logs policy. And they’ll protect your privacy, even when the authorities request information from them. Mostly because they don’t have anything to share anyway. Indeed, they keep only the bare minimum: Username, password, and e-mail. And you can use a pseudonym and pay with bitcoins to guarantee your anonymity when you use the service. In this section, I’ll focus only on the features of the client. And not on the features of the browser extensions. 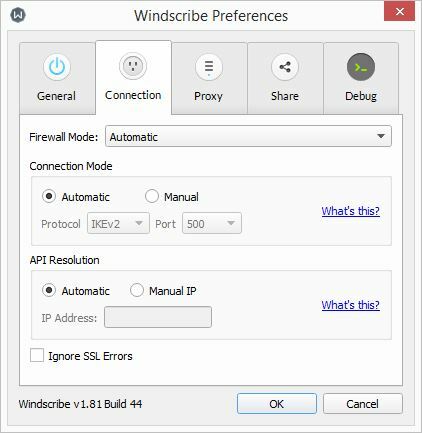 As part of this Windscribe VPN review, I’ll write a dedicated section for Windscribe Chrome, Firefox and Opera. Privacy is at the core of their company. So they’ve implemented a kill switch feature to their client, of course. But they don’t call it a kill switch: They call it Firewall. As a reminder, this feature prevents your IP address to leak if your VPN connection drops. And it’s mandatory when you’re watching video streaming or downloading torrents. Because your Operating System (OS) tends to reconnect your device without the VPN. Their Firewall is activated by default, which is nice. But it doesn’t work like a standard kill switch. Because it’s enabled only when you connect to a VPN server. Meaning: If you only launch the client, your default internet connection remains active. But once you connect to a VPN server, all your traffic goes through the VPN. And if the VPN connection drops, your device won’t reconnect to Internet until the VPN is back online. I’ll not explain what is a DNS leak here. Because it’s too complicated and I’ve already written a detailed article about it. But the Windows client offers a protection against DNS leaks for IPv4 and IPv6. And it’s a good thing to protect your online privacy. Also, it’s always enabled and you don’t have to do anything special to get it. In the Preferences, you’ll find the list of all the available protocols. 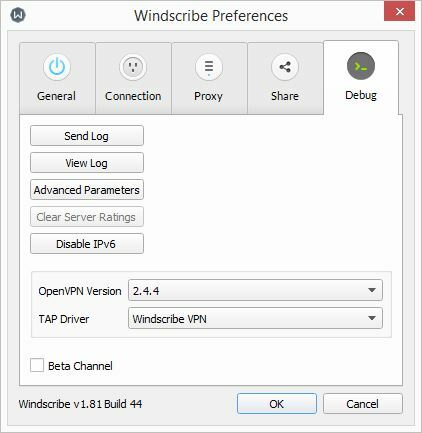 As a rule, I recommend using Windscribe OpenVPN. But if you need to travel to countries with high censorship (China, Iran, etc. ), you should use Stealth. It’s their home-made protocol. And it allows to bypass Deep Packet Inspection (DPI) thanks to Stunnel proxy. While it’s slower than OpenVPN, it should allow you to browse an open internet anywhere. These are quite unusual features. So they deserve a section in this Windscribe review. 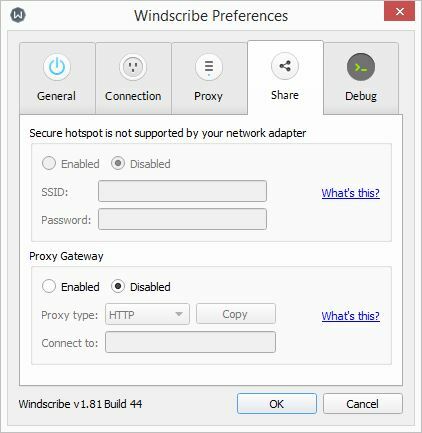 Secure hotspot allows you to create a secure Wi-Fi hotspot on your Windows computer – sorry Mac and Linux users. And then you can connect all your other devices, or even your family’s or friends’ ones, to the VPN. 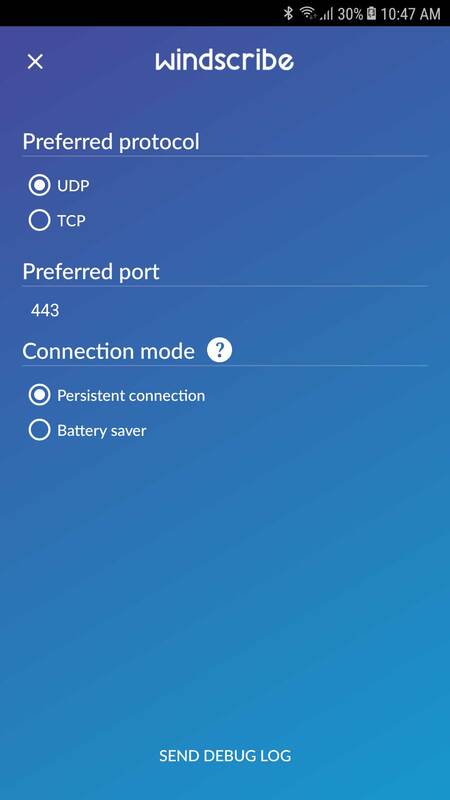 There are two advantages here: You can share your VPN connection, without having to install the client on the devices. 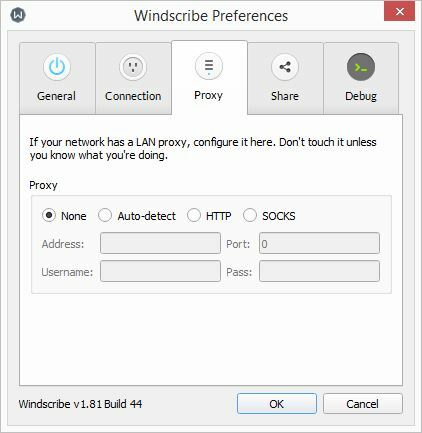 Proxy Gateway allows you to create a secure HTTP or SOCKS5 proxy on your Windows or Mac computer – sorry Linux users. 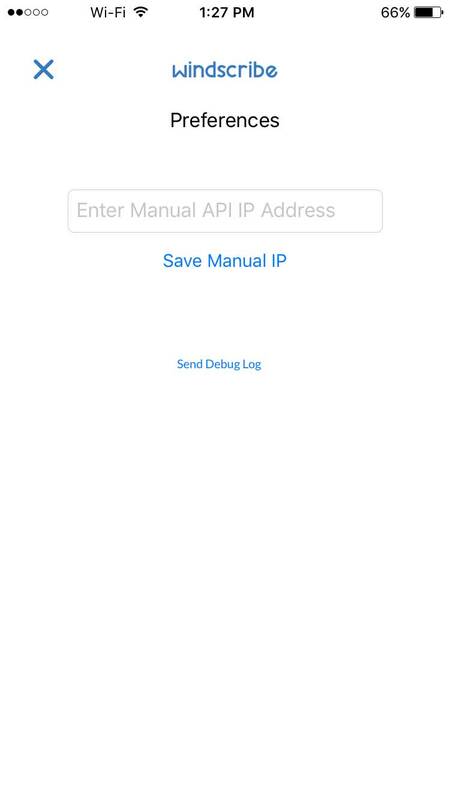 And then you can connect all the devices that support proxy servers and grant them an access to your secure connection. Basically, this feature is only for your television, your console, or other similar devices. And it works only on your local network. First of all, the client is user-friendly: Anyone can use it – no need to be tech-savvy. After Windscribe download and installation, it’s set on Best Location by default. So you just need to click on the ON/OFF button to connect to the server with the best performances, depending on your location. And you’re protected. If you need to select a different location, you can easily browse the server list. And when you click on a country or on a server, the client will connect to the selected country/server. The only thing I don’t like is the sorting of the countries, really. Because it’s neither sorted alphabetically nor on the ping-time. And I can’t understand the logic behind it. Also United Kingdom usually ends up in the middle of the list… But that’s only a detail. One of the good things of this compact client is that you can easily change server, compared to other software. And you don’t need to disconnect first – so you save some time. Just select another server from the drop-down list and click. And the client will automatically disconnect and reconnect to the selected server. I think they’ve found a good balance regarding the preferences available in the client. Because the most essential options are there, with the right level of details. Click on the hamburger menu (on the top left of the client). And click on Preferences: You’ll find 5 tabs to tweak the client. But don’t worry! You don’t need to do anything to make it works. This is just for advanced users. They’ve been pretty thorough with their apps, covering all the most popular platforms. So you should be able to protect all your devices without having to set them up manually. Unlike most of their competitors, for which a browser extension is only a gadget, they’ve developed a real standalone software. I don’t like to install extensions in my browser. Because they slow it down. And because there are frequently bugs that allow to track users or leak their data. Cruise Control: When browsing a restricted website, the extension automatically find the correct server to unblock the content. Double Hop (double VPN): To add an extra layer of privacy protection, you can connect 2 VPN servers at the same time. The first one with the client and the second one with the extension. And the only drawback is a slower speed. Ad Blocker: The extension can block all the ads, trackers, and links to social networks. And it allows website to load faster while protecting your privacy. Timezone Spoofing: Another great feature to unblock geo-restricted content! When enabled, it sets the clock of your browser to the same time zone as the VPN server, to be even more realistic. Cookie Monster: This feature deletes the cookies when you close a tab, thus improving your privacy. Split Personality: This feature allows you to can randomly switch user agent to hide your tracks. Wow! Privacy score is D… And there are 6 trackers on the page… You’d better use Windscribe! Windscribe is a Canadian VPN. And they provide a VPN service that encrypts your connection. Therefore it protects your privacy and increase your security. Furthermore, it allows to watch the American and British libraries of Netflix via dedicated Windflix servers. In addition, their no-logs policy combined with the possibility to use peer-to-peer protocol on selected servers make it a good tool to download torrents safely. You can subscribe to their affordable package. Because they have an aggressive sales strategy. But you'll have to go for their yearly plan (at minimum). Finally, I'll keep an eye on how this recent VPN provider evolve. I hope they'll be able to keep offering their free subscription. But a VPN service is costly to maintain. And this strategy could be only a way to create a new user database. Wait and see.